Simlipal National Park originated primarily as a hunting ground for the royalty. 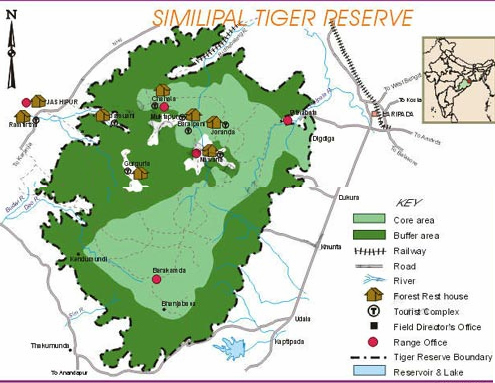 It was formally designated a tiger reserve in 1956 and under Project Tiger in May 1973. It was elevated to a national park status in 1979. Located in the Mayurbhanj district of India's coastal state of Orissa, Simlipal National Park is an ecosystem complete with forest vegetation (mainly sal trees), fauna and the adjoining Santhal tribal settlements. High plateaus and hills, the highest peak being the Mangesheri, surround the forest. At least 12 rivers cut across the plain area. The prominent among them are Burhabalanga, Palpala Bandan, Kahairi and Deo. This sprawling forest also has many waterfalls that are a perpetual attraction to the tourist. It has withstood two cyclones. in 1982 and 1999. without any irrevocable damages and continues to enchant visitors. This sprawling ecosystem, thanks to the mega conservation efforts, has close to a 100 tigers. Other mammalian species like leopards, sambhars, langurs, deer, gaur (Indian bison), elephants, antelopes, chitals, chevrotains, wild dog, wild boar, sloth bears, monkeys, hyenas and porcupines are also found here. There are around 230 species of birds in these forests. The ones officially recorded include the red jungle fowl, hill myna, peafowl, alexandrine parakeet, crested serpent eagle, gray hornbill, Indian pied hornbill, Malabar pied hornbill and Indian trogon. Most of these bird species may be spotted in the park. s Newana area. There is a sizable population of reptiles as well, which include snakes and turtles. The population of crocodiles has increased considerably since the inception of the Mugger Management Program. Simlipal National Park is a floral treasure as well. It has close to 501 species of plants belonging to 102 families. Eighty-two species of orchids have already been identified here along with the omnipresent sal trees. Innumerable medicinal and aromatic plants are found as well that are a source of earnings for the local tribal population. A panoramic view of the park can be enjoyed from Barheipani (1308 ft.) region. The most beautiful and scenic waterfalls of the park are found here and at Joranda (493 ft.). The park is a treasure house of 501 species of plants belonging to 102 families. 82 species of orchids have also been identified here. It has a mixed type of vegetation with Northern tropical semi-evergreen trees and Northern tropical moist deciduous trees. Plus, dry deciduous hill forest and high level Sal forests. The grasslands and the savannas provide grazing grounds for the herbivores and hiding place to the carnivores. The forest boasts of innumerable medicinal and aromatic plants, which provide a source of earnings for the tribals. During summers, light cotton clothing is essential whereas woolens would suffice during winters. Permit for entry to the park must be collected at Baripada. The Santhal tribes that live in the Simlipal forest celebrate feast and dance during January, which tourists may attend by prior notification. A team headed by the Field Director carries out research under Project Tiger. Rights of admission to the laboratory and field facilities of Project Tiger are restricted, but officials do not discourage the visits of tourists/ecology students and extend all possible help by providing information/literature about the park as well as the tiger conservation project. Project Tiger also concerned itself with the care of other animals. After the project was launched, the park saw an increase in population of not only Tigers but also Leopards, Sambars, Langurs, Barking and Spotted Deer, Gaur, Elephant and the 'Four-horned' antelope. The protected environment of the park has provided shelter to a number of other mammals. 231 species of birds nest in these forests. Red Jungle Fowl, Hill Mynah, Peafowl, Alexandrine Parakeet, Crested Serpent Eagle are common. The Grey Hornbill, Indian Pied Hornbill, Malabar Pied Hornbill and Indian Trogon are also found in the reserve. Apart from the large number of mammals and bird species, the park has a sizeable population of reptiles, which includes snakes and turtles. The Mugger management programme has helped the Mugger crocodile to survive and flourish on the banks of river Khairi. Climate	: During summers, the temperature is very high (around 40°C) whereas during the winter it falls to about 14°C. The monsoon season brings moderate to very heavy rainfall. Airport	: Nearest airport is Kolkata which is 262 km, Bhubaneswar which is 270 km. Railway Station	: Nearest station is Baleshwar on the east coast railway. There are deluxe buses between Baleshwar and Baripada. Road : Highway to Baripada from Kolkata or Bhubaneswar, Pithabata is the entry point from the Baripada side. One can enter from Jashipur side also.